SpeedConnect Internet Accelerator v.10.0 just released! Easy, Safe and Fast optimizer to speed up your internet connection. Software to speed up your internet connection. You can use this network optimizer to speed up your Dial-Up Modem, DSL, Cable, Wireless and LAN internet connection. For Windows® 10, 8, 7,Vista,XP. 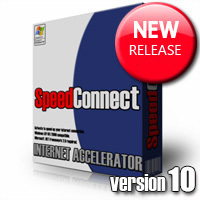 SpeedConnect Internet Accelerator is a Windows application designed to optimize and speed up your network connection and all your internet related activities. This translates into a faster internet connection, faster browsing and email, faster downloads, faster online gaming, improved Skype connection. Easy, safe and fast optimization of your existing internet connection. *Note: Requires Microsoft .NET Framework to run. Scroll down for more screen shots. Provides a quick way to analyze your connection. Provides the fastest way to optimize your connection. Provides manual access to main Network Settings. Provides manual access to additional Extra Settings. Provides access to SpeedConnect's tools and wizards. "SpeedConnect accelerator prevents fragmentation in data transfer and optimizes your Windows TCP/IP settings for faster Web browsing, e-mail, and downloads." "If you are bothered by slow connection speed, SpeedConnect is a safe, fast and inexpensive way to optimize your system settings." "CBS Software's SpeedConnect Internet Accelerator tops overall." "SpeedConnect can automatically work out the best way to squeeze that extra bit of speed out of your computer"s Internet connection." "...in a few words: Easy to use, AOL adapter support, Excellent online help, LAN and DUN support"
"Fantastic software! Dear Sirs, About three and a half years ago I moved from South Africa to New Zealand. Regrettably I moved to an area with no land line connection. Gone was my internet free talking to SA on Skype. Luckily I discovered your program and opted for the fee trial. Eureka! It works on a 2g connection and I now talk to family and friends. I thank you very much . A very grateful Dave. " "I have to write to tell you this! I purchased your SpeedConnect Internet Accelerator last night and I have been running tests all day at different test sites! This software is the ultimate accelerator, nothing I have previously tried out even comes close to yours! I have 5 MB ADSL pppoe Lan and the best I have ever got speed wise is 700 KB's download! Today on all the tests I did I was getting an average of 825 KB's that is an 18% improvement in download speed and uploading speed were proportional! To me that is phenomenal! I mentioned this to my IP and he was in awe! That was the best investment in software I have ever made! I am an Advance Computer Applications Analyst and testing of software is my livelihood! Keep up the good work on your product, but truthfully I can't see how it could be improved upon, it is hard to improve on perfection!! " "I have tried many so-called Internet boosters. They all have been totally worthless. Your product really speeds up my Internet connection substantially. You have done a wonderful job there in CBS, and I would like to congratulate you and your teams for a job well done! I have endorsed SpeedConnect to all my friends here in Helsinki." "Today I downloaded and installed SpeedConnect. I had been using another web accelerator program but was having problems with it. I found SpeedConnect to work better and give noticeable results." "I was plagued with speed problems with my cable modem since it was installed. Since I have installed and optimized with SpeedConnect, my speed has increased dramatically - anywhere from 2x to 10x the speed I was getting previously..."
"I am eternally grateful for your product. Worth every penny just in the amount of saved time while downloading or surfing the internet. Thanks again! " "It's the Best of the Lot! I am stuck having to use an analog modem (no DSL in my area). I tried EVERY dial-up-modem accelerator and this is the one that works the best of all (for my system)."